News broke in July 2015 that the Rosetta mission’s Philae lander had discovered 16 ‘carbon and nitrogen-rich’ organic compounds on Comet 67P/Churyumov-Gerasimenko. The news sparked renewed debates about whether the ‘prebiotic’ chemicals required for producing amino acids and nucleotides – the essential building blocks of all life forms – may have been delivered to Earth by cometary impacts. The argument goes that the shock of an impact may be sufficient to produce these essential life chemicals, so seeding the young Earth with the ingredients required to get life kick-started. It’s an appealing idea. Estimates of the quantity of prebiotic organic substances available on the primitive Earth are sensitively dependent on assumptions about the nature of Earth’s early atmosphere. However, in one such estimate, a total of one hundred billion kilograms of organic material is thought to have been made available to the primitive Earth each year, of which the dominant source is so-called ‘exogenous delivery’ by comets. The amount of biomass on Earth today is estimated to be of the order of a million billion kilogrammes of carbon. If these estimates of the amount of available prebiotic organic material are order-of-magnitude correct, then a quantity equal to today’s biomass could have accumulated on the primitive Earth within just ten thousand years. But delivery is only the beginning, of course. We might suppose that any organic chemicals leaching from the debris of cometary impacts will likely become dispersed in the Earth’s vast oceans, oceans that are being churned by the gravitational influence of a Moon that is much closer than it is today. And, unfortunately, logical next step in the journey to life requires that we string the building blocks together to form long chains, leading eventually to proteins and nucleic acids. This coming together is going to be very difficult if the building blocks are greatly diluted in a large volume of water. 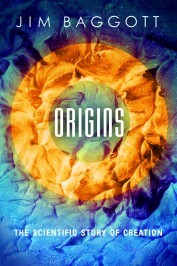 Now it’s a simple fact that there is no such thing as a ‘standard model’ for the origin of life. Unlike particle physics and cosmology, there is no consensus theory that provides a commonly-agreed, standard interpretation. The Lost City alkaline hydrothermal vent field features a collection of about 30 carbonate chimneys each between 30-60 metres tall. This picture shows a five-foot-wide ledge on the side of a chimney which is topped with dendritic carbonate growths. Public domain via Wikimedia Commons. 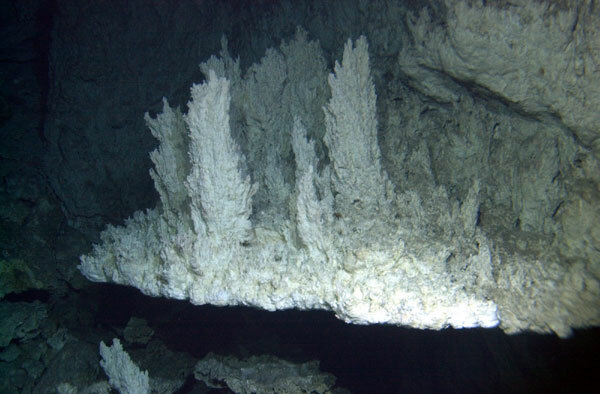 But I personally like the idea that life might have begun in the environments of alkaline hydrothermal vents. These are geological features that can be found close to the spreading centres of the Earth’s tectonic plates, such as the Mid-Atlantic Ridge which runs along the floor of the Atlantic Ocean. Such vents are sources of molecular hydrogen, a side-product of a natural geological process called serpentinization. In one possible scenario, the hydrogen reacts with carbon dioxide dissolved in the ocean, catalysed by iron-nickel-sulphur minerals. This is the first step in a sequence which can potentially produce a huge assortment of organic chemicals. I suspect that the real message from Comet 67P and from the array of substances found in interstellar molecular clouds is that the production of prebiotic chemicals, and thence amino acids and nucleotides, is a really rather irresistible consequence of chemistry, however and wherever it happens. And there’s more. The vents form tall chimneys of calcium carbonate, structures with interconnecting pores of the order of a tenth of a millimetre. These could well have been the places where organic chemicals produced by natural processes became trapped and concentrated, allowing a trial-and-error biochemistry to develop. This environment provides a natural electrochemical gradient (a flow of positively-charged protons across the thin inorganic membranes between the pores), very reminiscent of the mechanism by which living cells manufacture adenosine triphosphate (ATP), used to transport energy. The path leading from a primitive metabolic cycle, to RNA, to the genetic code, to DNA and to primitive cellular structures is highly speculative but nevertheless quite plausible. Evolutionary biochemist Nick Lane, at University College London, has built a simple bench-top laboratory reactor (in the University’s aptly-named Darwin Building) with which he and his colleagues hope to simulate the chemical and geological environment of an alkaline hydrothermal vent. Early experiments have provided a preliminary proof of concept, and some empirical evidence that mild alkaline hydrothermal conditions, a supply of molecular hydrogen and carbon dioxide, an iron-nickel-sulphur catalyst and a micropore structure transected by natural proton gradients can indeed produce simple organic chemicals. Further results are expected this year.